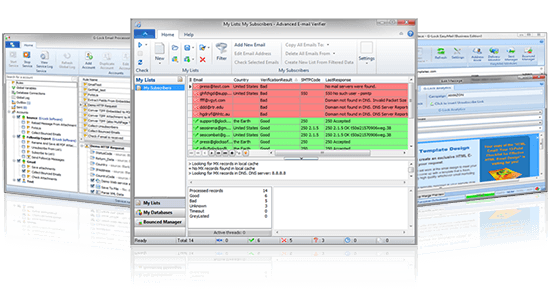 Powerful Hybrid In-House Email Marketing Platform for Windows® that works with any SMTP relays. Detect and Fix Potential Delivery Issues. Boost your results, protect your sending reputation and send with confidence. Enables our subscribers to track opens, clicks, forwards, prints, deletes, email client usage, and much more. Extract data from inbound emails. Automate your workflow within minutes and save valuable time. Download free 30-days trial and replace your manual copy & paste routine with a fully automated process. Clean your List from bad e-mail addresses and invalid domains, reduce delivery failures and email bounces. Get unrivaled feature set and virtually infinite flexibility, at a fraction of the price charged for competitive programs. G-Lock Software delivers you powerful and PROFESSIONAL yet easy-to-use software that suits perfectly for targeted bulk email marketing campaigns, email list management and e-mail processing at your desktop. G-Lock Email Marketing Bundle combines an unrivaled feature set with world-class support and virtually infinite flexibility, at a fraction of the price charged for competitive programs. Backlink Diver is powerful SEO software that includes Backlink Verifier, PageRank Checker and Backlinks Index Checker. It helps you control SEO quality of pages linking to your website and shows you anchor text analysis of your linking profile after each link building campaign. G-Lock SpamCombat – helps fight spam and delete unwanted emails, before landing in your inbox. This is a 100% FREE self learning system that 'automatically' detects spam with great precision and accuracy, adapts to new types of spam, plus, it stops viruses and malicious code.